As each new generation of entrepreneurs emerges, there is a renewed interest in how venture capital deals come together. Yet there really is no definitive guide to venture capital deals. 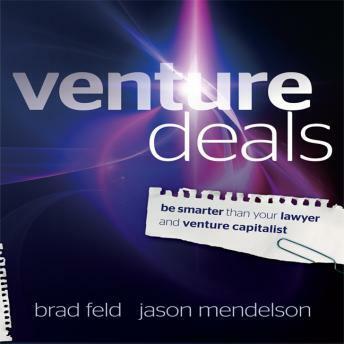 Nobody understands this better than authors Brad Feld and Jason Mendelson. For more than seventeen years, they've been involved in hundreds of venture capital financings, and now, with Venture Deals, they share their experiences in this field with you. Inspired by a series of blog posts-created by the authors after a particularly challenging deal-this reliable resource demystifies the venture capital financing process and helps you gain a practical perspective of this dynamic discipline. Whether you're an experienced or aspiring entrepreneur, venture capitalist, or lawyer who partakes in these particular types of deals, you can benefit from the insights found throughout this book. Engaging and informative, Venture Deals skillfully outlines the essential elements of the venture capital term sheet-from terms related to economics to terms related to control. Feld and Mendelson strive to give a balanced view of the particular terms along with the strategies to getting to a fair deal. In addition to examining the nuts and bolts of the term sheet, Venture Deals also introduces you to the various participants in the process, discusses how fundraising works, reveals how VC firms operate, and describes how to apply different negotiating tactics to your deals. You'll also gain valuable insights into several common legal issues most startups face and, as a bonus, discover what a typical letter of intent to acquire your company looks like. While it would be desirable to do venture capital deals with a simple agreement on price, a handshake, and a short legal agreement, this rarely happens. Venture Deals reveals how venture financings really work, and will save you a remarkable amount of time and money in your journey to create an amazing company.